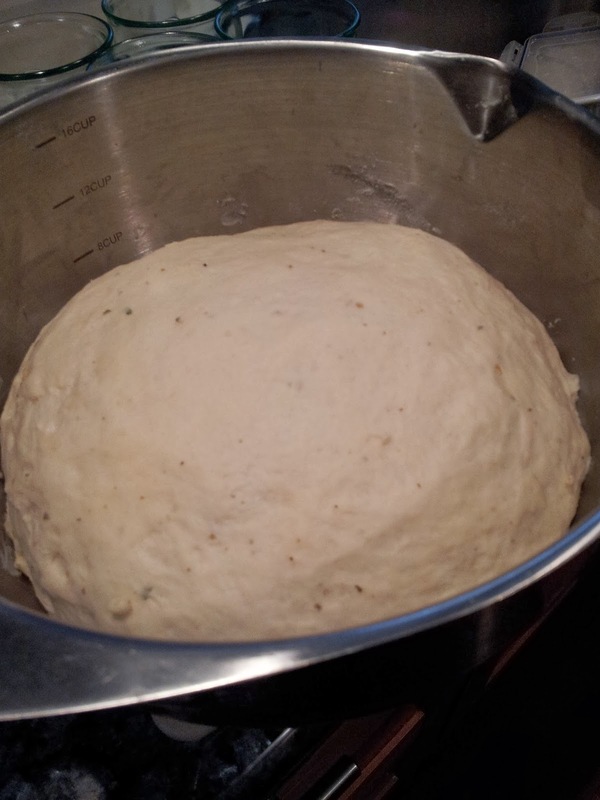 But maybe it's because I'm finally sharing my most prized, and really most simple, recipe - pizza dough. When I was a child (what? ), I had a subscription to National Geographic's World Magazine - which, as I'm sure you can guess, was National Geographic for kids. Every edition (or so my memory tells me) would have a recipe - from *different* parts of the world - and, being the lucky (ie only) child that I was, my parents let me make whatever exotic fare was featured. We made chocolate mousse (which, btw, I over whipped - still delicious), soft pretzels, and tandoori chicken (for which, I distinctly remember my parents having to get a second mortgage in order to pay for the array of spices) - But the one recipe that stood above them all was the Pizza Dough recipe. 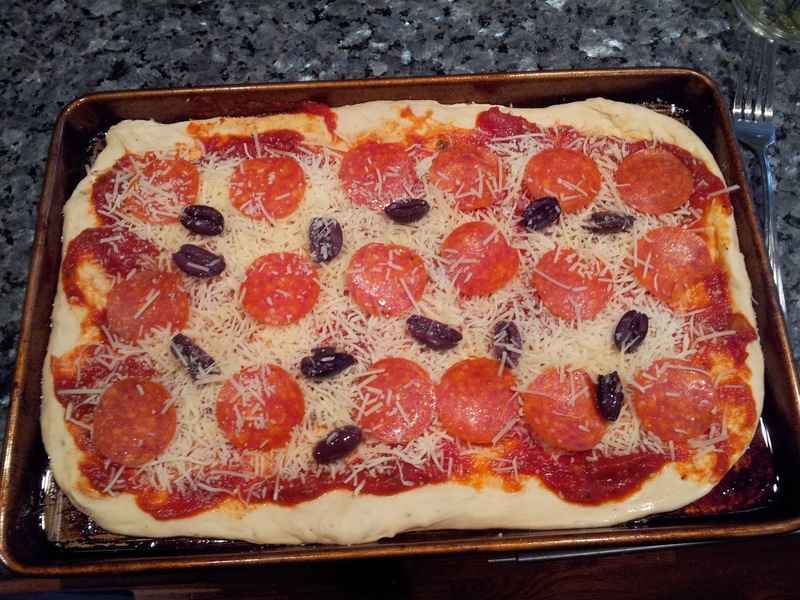 We were a Chef Boyardee Pizza in a box family, so we were used to mixing the dough - putting it at the base of the refrigerator (until we got a dog) to rise, adding our own toppings and all that - but this fresh dough recipe was so good - there were no more boxed pizzas. As I said, it's simple. But it works and can be adapted for many different uses. The dough made its first appearance at a tailgate in the mid aughts. 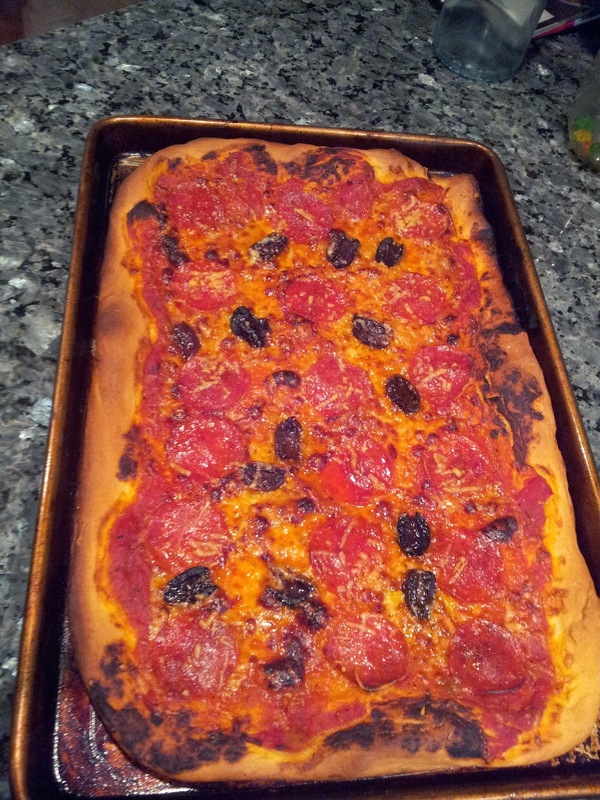 By then I had figured out that the dough could be pre-cooked and then heated up (with toppings) on the grill. *I often vary the amounts of sugar and salt, depending on taste; additionally, the amount of oil can be between 1- 3 tablespoons. Combine yeast, water, and sugar in a medium sized bowl. 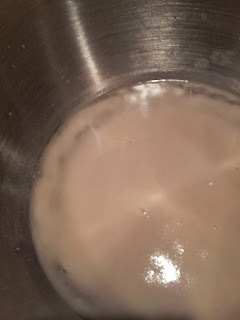 If needed, stir gently until all yeast is saturated (i.e. under/in the water). Cover loosely (with lid, plastic wrap, kitchen towel...) and let sit for 5-10 minutes. The yeast should foam/bubble up a bit. Cover the bowl and set it in a warm, dry place. A warm, dry place can be a countertop, an oven with a "proof" setting, on top of a stove... pretty much anywhere. Let the dough sit for 30 to 60 minutes. 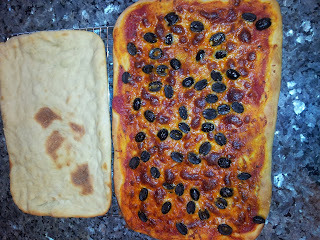 You want the dough to rise, but sitting time is really up to your patience. While the dough is rising, pre-heat your oven to 425F. 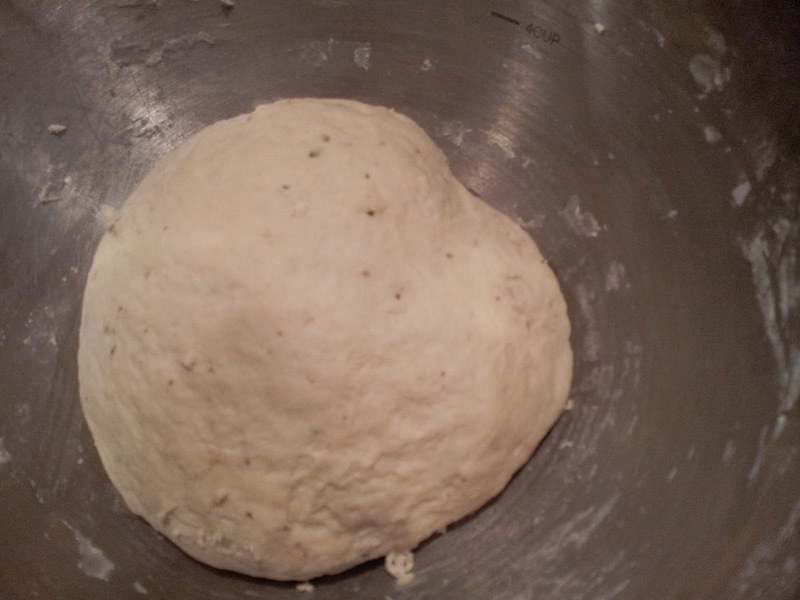 Turn the dough out of the bowl (read: dump out) and divide in half. 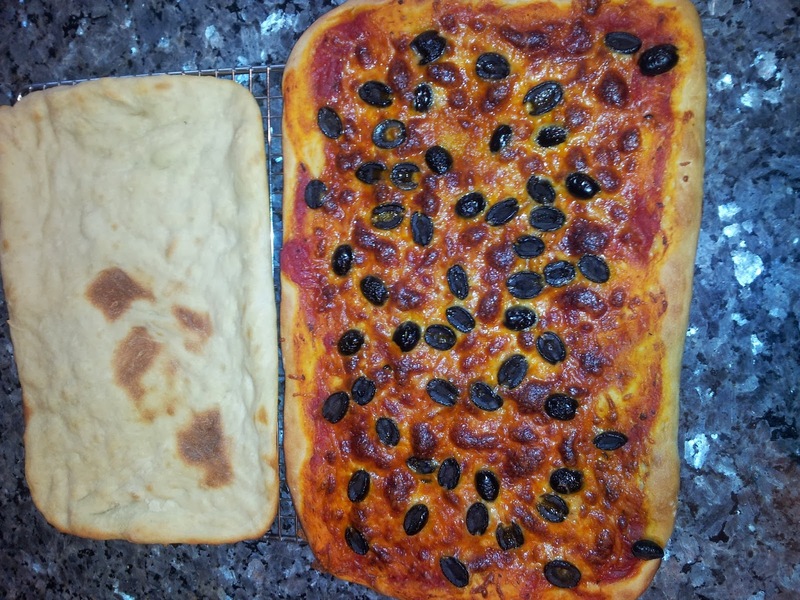 This recipe *traditionally* makes 2 pizza crusts, but it can easily be made into 3, 4, etc. smaller crusts as well. Spread out 1 piece of dough into your chosen pan - the best way (IMO) to do this is to gently dimple the dough with your fingertips and then press out to the sides of the pan. If you're going to use immediately, add toppings and bake for 18-20 minutes, or until the crust is golden brown. 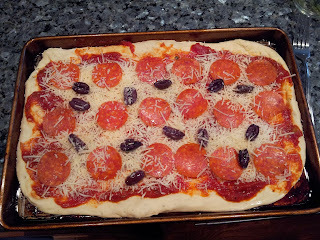 Remove from oven and let sit for 5 minutes (or so); remove from pan onto a cutting board and enjoy! If you're going to use the crust later (either in the oven or on the grill), bake untopped crust for 15-18 minutes, or, until the crust is a blond golden color. Remove from oven and let sit for 5 minutes (or so); remove from pan onto a cooling rack and let cool completely. Once cooled the crust(s) can be wrapped in plastic wrap and kept in the refrigerator (for a few days) or in the freezer. Whether using on the grill or in the oven, let the crust (thaw and) come to room temperature. Pre-heat your grill to medium heat or your oven to 400F. Top as you like and grill/bake until crust is golden brown/toppings are warm/melted - usually around 10 minutes.